Many avenues lead people to the Catholic Church. A conversation with a Catholic friend or co-worker may bring about an inquiry into Catholicism. A visit to a Catholic church for a wedding or funeral may pique curiosity. Perhaps something read in the newspaper or seen on television sparks an interest in Catholicism. Many people reach a point where they find themselves asking questions about life’s meaning, world issues, and their own directions. Some individuals have been inactive member of a Christian denomination and are now seeking a richer spiritual life. Whatever path that has brought you into inquiring about Catholicism it will lead you to the Rite of Christian Initiation of Adults (RCIA). What Does the RCIA Mean? The RCIA stands for the Rite of Christian Initiation of Adults. It’s the process through which unbaptized adults and older children are formed in the teachings and practices of Catholicism and are initiated into the Catholic Church. It’s marked by various rites or rituals, which usually occur at Sunday Mass. The process also includes baptized adult Christians or Catholics who are preparing to receive the sacraments of Confirmation and Eucharist. What Happens in the RCIA? Most processes are a series of weekly sessions with a team of catechist (religion teachers), sponsors, and fellow participants. Each session is a safe place to discuss the faith and explore questions about Catholicism or religion and spirituality in general. All questions are welcome and honored. God invited Mary to be the mother of Jesus because Jesus couldn’t be born without her free and informed consent. Before giving her consent, Mary ask “How can this be?” (Luke 1:34). Like Mary, we all have free will to accept Jesus into our lives and to ask our questions. That’s how much God respects–and even expects–your honest questions. This process began in the earliest years of the Church. In those first centuries, it was a challenge to convert to Christianity because the Roman Empire often persecuted those who didn’t follow its religion. The Church wanted to make sure that candidates really knew what they were doing and were willing to stand up for their faith in a hostile environment. In the 1960s, the Church called for a return to this early model in order to provide Christian formation in the same gradual way people experience and enter any lasting and loving relationship. How Long Does the RCIA Last? It depends. People come with their own unique stories and needs. While our classes begin in early fall and end at Pentecost, the process could last longer or shorter depending on your unique story or needs. This approach allows you to proceed at your own pace. Understanding faith is as important as having faith, and that takes time. Come with an open heart and an open mind. Get to know as much as you can. Each week, you’ll be invited to reflect on Christ’s words and deeds and witness or even practice some Catholic behaviors to see if you feel called to this life. Inquiry (Evangelization and Precatechumenate): During this period, anyone can test the waters and ask questions about the Catholic faith. No commitments or promises are made. This period can last as long as you desire–a few months up to a few years. Catechumenate: This words comes from ancient Greek, the language of the early Church. Catechumen means “a person receiving instruction.” During this period, you will study and discuss most of the Church’s main beliefs. You will also have a godparent or sponsor join you on your journey. This person can be a Catholic family member, a wise and good friend, or someone from the parish suggested by the RCIA team. Your sponsor should attend the RCIA sessions with you regularly and continue conversations with you outside the RCIA. They also serve as your representative and advocate to the Church. Purification and Enlightenment (Lent): This period occurs during the weeks before Easter and may include any of several optional rites. This time is more prayerful than instructional. It is a time of deeper spiritual preparation for the sacraments. 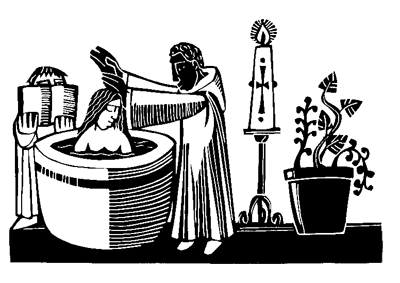 Then, on the night before Easter, during the Vigil Mass on Holy Saturday, those who have completed their preparation enter the Church through the sacrament of initiation: Baptism, Confirmation, and Eucharist. Mystagogy (Postbaptismal Catechesis): This final period usually lasts several weeks–from Easter to Pentecost. It’s a time to reflect on the mysteries of the sacraments and to begin living out your new faith in practical ways. Once your RCIA Adult Inquirer Information Form is returned an interview will be scheduled before the start of classes.